These aesthetically appealing braces are available in translucent white to blend with the teeth making them less visible than traditional braces. Lingual braces are applied behind the teeth as compared to metal or ceramic braces which are applied to the front of your teeth. Often called “Invisible Braces”, they are the best and only non-visible form of fixed orthodontic therapy. Although lingual braces are more expensive they offer a highly cosmetic alternative to those patients who otherwise would not consider treatment. HOW ARE LINGUAL BRACES DIFFERENT FROM OTHER TYPES OF BRACES? Lingual braces differ from other types of teeth straightening treatments in a number of ways. When you begin to compare lingual braces vs. metal braces, the most noticeable difference is that lingual braces are positioned behind the teeth rather than on front of the teeth. Another difference is that, unlike traditional braces, these are custom-made to match the contours of your teeth. The treatment involves your orthodontist taking a mold of your teeth and sending it to the lab that will actually create the custom brackets and intelligent wires. The brackets are then applied to the back of each tooth and connected with a wire by your orthodontist. WHY SHOULD I CHOOSE LINGUAL BRACES? The primary benefit of lingual braces is an aesthetic one. Because the braces are located behind the teeth, there is less of a self-esteem or confidence issue associated with wearing them. A natural smile is still seen, even though the braces are firmly attached. Lingual braces take the same amount of time to adjust teeth when compared to other forms of braces. Though they are considered the most expensive type of braces to have installed, they are also the least visible and for many people the cost is worth the lack of visible braces. The initial problem with lingual braces is that they are more difficult to clean. Because they are behind the teeth, it can be difficult to see all the food debris that could be stuck in the brace, meaning more time must be invested in the daily cleaning to prevent future teeth issues. Lingual braces are not considered the right option for more severe cases of teeth realignment either. Only specific types of teeth straightening can be done with these braces and that can only be determined by an exam from your dentist. Any adjustments that need to be made also take longer and the overall cost of these braces is often more because of the extended work that is involved to install them and then care for them over time. Because the braces are on the back of the teeth, tongue irritation is a common side effect that people experience. Some speech issues can also be troublesome for the first couple weeks after the braces have been installed. WHAT CASES ARE COMMONLY TREATED WITH LINGUAL BRACES? 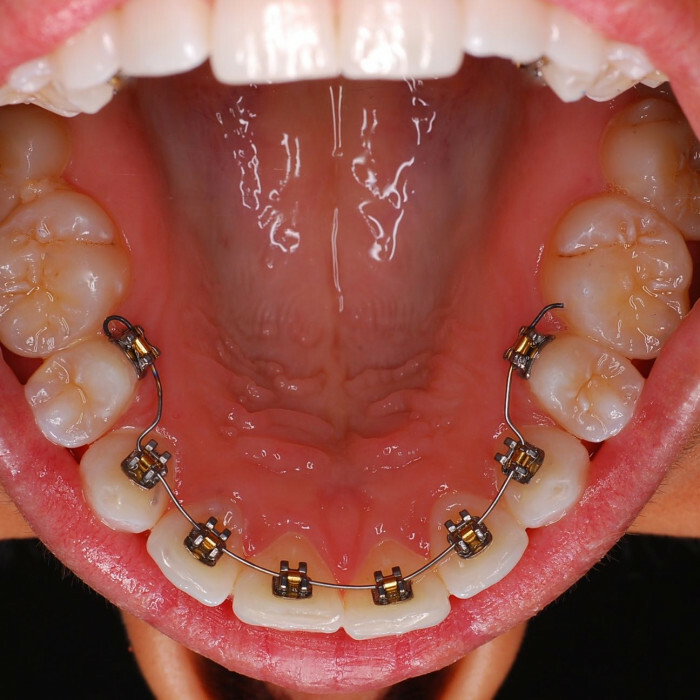 Lingual braces are capable of realigning teeth with a number of different orthodontic issues. Some problems that are commonly treated with behind the teeth braces include malocclusions such as overbites, under bites, and cross bites. Lingual braces are also used to treat crooked teeth and crowding issues. This adult orthodontic treatment is a great option for anyone in a number of professions. Because these braces are at the back of the teeth, just about anyone can wear them. Overall, professionals who are required by their jobs to constantly face clients and speak in front of groups benefit from the discreet nature of this teeth straightening solution. The Schulhof Center is uniquely equipped to help you discover the benefits of these behind the teeth braces as they are a 100% lingual office. This means that they are experts in this type of orthodontic treatment, especially when it comes to the Incognito and Incognito Lite options. Your first appointment for lingual braces involves taking an impression of your teeth. This impression will then be sent to a dental laboratory where your customized brackets are created using CAD/CAM and rapid prototyping technologies. Wires are created and bent using robotic technology. This process takes a few weeks. Once complete, your lingual braces orthodontist will use a precise process to cement them onto your teeth. First, lingual braces are custom-made to your smile using CAD/CAM and robotic wire technologies. As with anything that’s custom-made or uses specialized technology, the associated costs tend to be higher. Treatments also tend to be more involved and timely than traditional braces because of this customization process. Second, lingual braces require specialized skills. Not every orthodontist offers lingual braces because this dental treatment requires extra training. For the ones who do, you can expect that he or she has taken continuing education courses; their expertise then figures into the lingual braces cost.